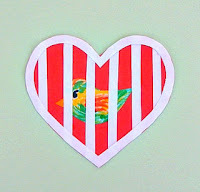 Μaria Chatzi, author of the ebook “Ο magikos kirios Kolotoumpas grafei istories”, shares with us step-by-step instructions to create our own heart cage bookmark, inspired by the fairy-tale “To aspro klouvi sto schima tis kardias” by Giorgos Grigorakis! 1. On one of the white paper scraps, draw a little bird with your pencil and color it with your markers. Cut it out and glue it onto the 8,5cm x 10cm red craft paper. 2. 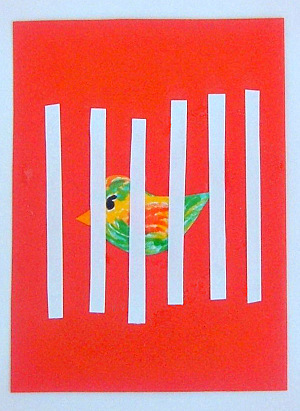 Cut very thin strips of white paper and glue them on the red craft paper where you just glued the birdie, hiding part of the bird’s body, as it would show behind prison bars. See picture 1. 3. 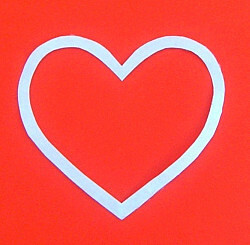 To continue, fold another white paper in half and cut out a half heart shape. Cut out the inside of the heart shape (you won’t need this), so as to be left with a heart frame, like the one you see in picture 2. 4. Now, glue the white heart frame on the bars the bird is behind. After that, cut around the heart cage with your scissors, as shown in picture 3. 5. Take your white satin ribbon and make dove-tail ends with your scissors. 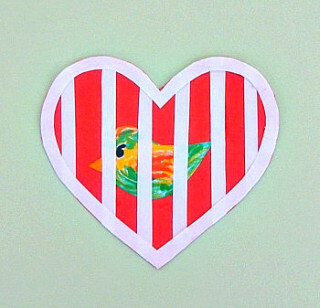 Finally, glue the heart cage with the bird on the ribbon. See picture 4. Your heart cage bookmark is ready!